Vocational rehabilitation (VR) agencies use many different models in engaging businesses at the state and local levels. They may operate primarily through a single point of contact (POC) in the central office, or have business specialists (who may have different titles) in each region that coordinate with the POC. In other cases, employment specialists (also with a variety of titles) are assigned to each local office as part of a placement team, or the agency holds counselors responsible for engagement at the local level--or some other combination. While there is a lot of overlap in the competencies needed in each of these roles, there are also important differences. For example, an employment specialist may need to know a lot about possible job carving or accommodations, while the development of marketing tools and agency use of social media would be important competencies at the central office level. The following table identifies several competencies relating to business engagement in a state VR agency, wherever it is happening. They are divided into three domains: Knowledge of Labor Market Needs, Communications, and Internal Management. Under these are competency clusters that are loosely placed into two categories depending their relevancy to either the State/Central Office level, or the Area/District/Local level. Some of the competencies are identified as “core” competencies (**) that are basic to any business relations initiative. Other competencies may not be as necessary based on the agency’s structure (e.g., not every VR agency will develop a business cadre). This table addresses competencies needed for the business engagement function, which is only one aspect of VR/business relationships. Competencies required to provide support to employers of individuals with disabilities are outlined here. Competency elements required for customized employment are being developed by the Association of Community Rehabilitation Educators (ACRE), and will be linked to this table once they are completed in early 2018. While not specifically included in this table of competencies, VR directors and senior leadership play an essential part in implementing business engagement across each of the domains listed below. For more information on this critical role, please visit the Models and Functions tab of this toolkit. Incorporate regional economic conditions, industries, and cultural diversity dynamics (i.e. businesses with proactive and public presence involving diversity issues) into a strategic planconcerning business engagement. Plan and deliver presentations to groups of individuals, parents, advocacy groups, civic organizations, etc. Plan and deliver presentations to groups of individual, parents, advocacy groups, civic organizations, etc. John Marchioro, Director of Training at the Illinois Department of Rehabilitation Services explains the LIFE Cycle of Business Engagement in this video filmed during a national conference. 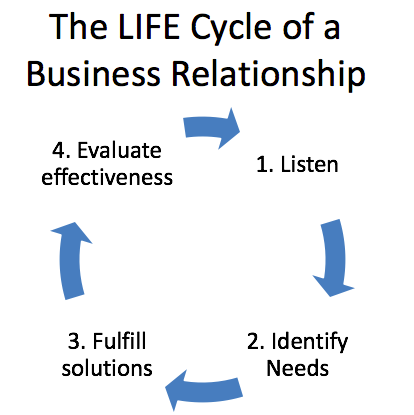 The LIFE Cycle of a Business Relationship provides a simple guide for VR staff as they initially engage with a business. How do you connect with business? First, Listen to business talk about their needs and interests. Next, Identify the support opportunities. What services can VR offer to business? Then, Fulfill solutions by providing information about what services and supports VR can offer. Finally, Evaluate effectiveness of the services VR provided to business. While the primary goal of vocational rehabilitation (VR) has been to support people with disabilities to obtain work that match their interests and goals, counselors must frequently manage the balance between their clients’ occupational goals and the opportunities that are available in their regional labor market. VR counselors have significant training and expertise relating to issues of disability, career development theory, restoration and accommodation strategies, etc. but little emphasis is placed on analyzing labor market information, networking, marketing—in short, the language of business engagement. Successful outcomes depend on the ability of VR to facilitate job matches that meet the needs of both the VR client and local business. This “dual customer” approach is well defined in the 32nd Institute on Rehabilitation Issues: The VR-Business Network: Charting Your Course [PDF], a valuable resource for developing business relationships. The document’s key message is that establishing quality relationships with and understanding the needs of the business community will create opportunities for the clients that VR serves. In response to the current mandates of the Workforce Innovation and Opportunity Act (WIOA), VR agencies must develop strategies for business engagement. They are creating plans and structures that fit the unique needs of their states. Many factors must be considered in building a business engagement structure including the position of the agency in state government, the size and budget of the agency, the number of allowable full time positions, and the industrial and economic opportunities within the state. Regardless of the approach, successful business engagement depends on the competent execution of a somewhat standard set of functions. VR agencies utilize many different models in engaging businesses at the state and local levels. They may operate primarily through a single point of contact (POC) in the central office, or have Business Specialists (with a wide variety of titles) in each region that coordinate with the POC. Some states have Employment Specialists (which also may have a variety of titles) assigned to each local office as part of a placement team, or hold counselors responsible for engagement at the local level. There are many combinations of approaches and unique job descriptions across the country. Click the following links to see examples of job descriptions for Business Account Managers [PDF], Business Relations Coordinators [PDF], and Employment Specialists [PDF]. Successful business engagement depends on the competent execution of a somewhat standard set of functions. Given the diversity and complexity common to VR counseling, in addition to increasing caseload sizes, counselors may feel challenged in developing expertise in business development. They may lack the experience and/or have difficulty carving out time for marketing and networking activities such as attending Chamber of Commerce meetings or holding career fairs. Many state VR agencies have responded to this issue by developing separate units, or cadres, whose primary responsibility is to make these types of business connections and maintain relationships. Regardless of the approach, competency-based staff selection and development are vital to the effort. People can make or break the best of plans. In general, there are two staffing levels to consider in developing a business services strategy. One is the systems level which comprises the strategy used by the state VR agency to position and market itself as a business partner. These functions are often centralized and rest with management positions. The other piece focuses more on individual relationships involving the VR job seeker, the job developer and the employer at the local level. While there is some overlap in the competencies needed at each of these levels, there are also important differences. For example, a position at the local level may need to know a lot about possible job carving or accommodations, while the development of marketing tools and agency use of social media would be important competencies at the central office level. The knowledge and skills necessary to a successful approach fall into three main categories of competencies. Every VR agency needs a strategy to systematically collect, interpret, and take action upon relevant labor market information (LMI) in your service area. This may include information available through your state’s workforce development agency or, some states have invested in third party “real-time” labor market tools. Both types of information can be used effectively to impact outcomes for VR clients and businesses. In addition, at the local level, business intelligence, or the common knowledge of a community’s marketplace, has great value. But the information alone is not enough. Staff at all levels need to know how to use it. An effort should be made to review regional client job goals and placements made over the recent year in order that business engagement activities are targeted and relevant to client’s placement needs within the context of the labor market information. A successful approach must include a communications strategy that will engage business, speak their language and demonstrate some industry-specific knowledge. Consider the skills to market VR to businesses at a variety of levels, from a viable source of labor that will meet their needs to a strategic economic development partner. Train staff on an approach to assess business needs. WIOA challenges VR to communicate effectively with partners, too, as we collaborate to engage business and employ a diverse workforce. Finally, staff must be able to track and measure the success of efforts. This should include necessary business information, VR job seeker outcomes, and internal communication among all staff engaged with businesses. The following charts list key competencies that should guide selection and development of staff. In addition, learning objectives are provided to assist in designing training programs that will help your staff develop the knowledge and skills necessary to better connect to businesses on behalf of the clients you serve. These competency clusters are loosely placed into two categories depending on their relevancy to either the State/Central Office level, or the Area/District/Local level. State/Central Office level competencies divided into three domains: Knowledge of Labor Market Needs, Communications, and Internal Management. Some of the competencies are identified as “Core” competencies (**) that are basic to any business relations initiative; other competencies may or not be as necessary based on the agency’s structure (i.e. not every SVR will develop a business cadre). Incorporate regional economic conditions, industries, and cultural diversity dynamics (i.e. businesses with proactive and public presence involving diversity issues) into a strategic plan concerning business engagement. Find, understand, and accurately interpret labor market information relevant to the whole state or major population areas in the state. Articulate approaches to leverage existing business relationships to create new opportunities. Describe the purpose of different types of employer recognition approaches. Design, develop, and implement opportunities that best suit the purpose. Design and field test marketing materials in various media that can be customized to the specific business audience. Write materials/develop media and in-person presentations that use language & images emphasizing participant strengths. Describe how/whether marketing materials balance participant choice to not disclose disability with VR’s role as a provider of employment services to people with disabilities. Describe the current and planned social media presence for the VR agency. Who Engages Businesses at Oregon Commission for the Blind? As part of their job-driven technical assistance project, the Oregon Commission for the Blind (OCB) and the Institute for Community Inclusion created a video series featuring OCB consumers, Oregon businesses, and OCB business engagement staff. This video explains how different staff at OCB engage with clients and businesses. Watch as OCB’s director of rehabilitation, business engagement coordinator, assistive technology assistant, and employment specialist share their perspectives on business engagement. As previously stated, a competent and well trained VR staff is a primary building block of an effective business engagement strategy. Clearly defined roles and expectations based on the shared vision and values of the organization lead to desired outcomes when there is an accountable working environment. It is critical that agency leaders help all VR staff to discover the specific ways in which their work contributes to a successful business engagement effort. This process of discovery helps to create ownership, commitment and ultimately much sought after mutual accountability across all roles and functions in the organization. Mutual accountability means that SVRA staff can count on each other to do what they are expected to do. Regardless of the particular agency’s structure or an individual’s role, when goals and expectations are clearly defined, feedback about achieving success becomes a shared responsibility. For example, when a VRC and a Business Relations representative work together toward a common goal with a mutual understanding of success, they can hold one another accountable for their outcomes. So, evaluating performance of staff is really about understanding what success looks like and then clarifying expectations for behaviors that get us there. We don’t have to wait for the formal, annual performance evaluation to provide feedback that keeps staff on track, nor does that feedback have to come from a supervisor. Professional staff can support each other in achieving success and help each other when they stumble, if they share the spirit of mutual accountability. That said, there are and performance expectations tied to specified job descriptions. Again, states vary somewhat in their design of their business service strategy. States who carve out their business service efforts typically have staff who are assigned to operate from two different perspectives; Business Engagement and Job Development. The business engagement staff is assigned to be the “face” of VR in terms of business. They network, cold-call, attend chamber meetings, organize job fairs and business recognition events, etc. They often act as a single point of contact or a portal, through which VR collects potential leads and active employment opportunities. These staff may or may not have contact with or experience in counseling individual clients. Marketing and outreach is their area of expertise. The other specific group is comprised of staff who possess skills that are more related to what is typical of job developers. These are the people who provide direct service to the client and the employer; they make the match. They may counsel the client in developing resumes and interview skills, they may arrange for on-site job coaching and/or they may help the employer develop necessary accommodations. Based on interviews with a number of states (California, Nebraska, Minnesota, Vermont and Wisconsin) who have created business service units, the Evaluation Metrics chart below describes functions and metrics that are typically used by these VR agencies to help them track the progress of their business connection/service activities. There is probably no perfect business engagement model that will translate to every state’s VR system. The key point to remember is that the knowledge and skills necessary for VR counseling, while related, are somewhat different from what is required in networking and creating business connections. If these functions are added to the counselor’s role, training will be necessary for this new skill set. For example, view business engagement trainings developed by state VR agencies. If you chose to develop a separate business unit, you will likely want to bring on new staff that come with marketing and communications experience. Some states may want to create a hybrid, developing new positions for counselors with specified job descriptions and redistributing workloads to afford opportunities for business activities. Regardless of your approach, recognizing the necessity to maintain a “dual customer” perspective and devoting time to develop the staff that makes your agency the “go-to” source of quality labor will equate to success for both your clients and the business community. Webinar View ExploreVR webinars, Skills for Business Engagement: Part 1 and Part 2 to learn more about the three key competencies of VR business engagement and how to make connections with employers. To provide effective support and consultation to businesses, it is essential to identify the knowledge, skills, and abilities of the state vocational rehabilitation (VR) personnel who provide support to employers in their own states and communities. The level of employer support by state VR personnel varies from state to state, and depends on the VR agency’s organizational structure. This table identifies several competencies relating to employer support in a state VR agency, wherever it is happening. The competencies are divided into three domains: Training and Coordination of Services, Connections and Relationships, and Providing Information and Support. Under these are competency clusters that are loosely placed into three categories based on their relevancy to either the state/central office level, the area/district level, or the local office level. It is important to note that this table of staff competencies and skills can also be very helpful in updating and creating job descriptions and staff performance review forms. As staff are required to do more support and consultation to businesses, there will be a need to ensure that both job descriptions and performance review forms match the skills, knowledge, and abilities you are expecting from them. This table has outlined many of the areas you may want to consider as you are making these revisions. As you will note business engagement activity is essential across all levels of personnel. Take a lead role in building strong relationships within the business community. Though this may be initially a business engagement tactic, once business partnerships are established, the agency will be in a position to be a resource to the business. The following table identifies competencies and potential learning objectives for training relating to Employer Supports in a State VR Agency, at State/Central Office level. They are divided into three domains: Training and Coordination of Services, Connections and Relationships, and Providing Information and Support. Describe available training resources along with areas of expertise, training modalities, and cost. Describe and explain the goals for employer support and evaluation metrics being used. Describe available resources in each of the targeted topic areas. Ensure that all staff are aware of the Job Driven Priority initiative and the agency strategic plans and goals including moving the agency to a dual customer approach. Take a lead role in building strong relationships within the business community. List the strategies being used/planned to build and maintain relationships with the business community. Be involved with the Governor’s Office of Business Relations, the State Workforce Development Council, State Chamber of Commerce, and similar organizations. Describe the organizations active and relevant to JD activities and how the state VR agency is involved with each. Explain the current system for recruiting and evaluating CRPs. Explain relevant state and federal regulations, tax incentives, and other financial incentives such as OJT. Demonstrate how the current budget supports these activities; or explain what would need to be changed in the current budget to provide this support. Explain the system for maintaining contact with employers and following up on VR placements Document ongoing contact using the agency’s system. Self-reported data from 163 employment specialists serving people with intellectual and developmental disabilities focused on four functions: getting to know job seekers, finding job openings, engaging employers to hire, and facilitating transition to a job. The table on page 20 lists 33 separate activities associated with the functions and could serve as a good crosscheck in building a job description or skill training curriculum. Probably the best book out there on job development: challenging, full of applications, and easy to use. Topics include characteristics of the entrepreneurial job developer, new paradigms for job development, job creation through employment proposals, capitalizing on business and social trends, developing partnerships with employers, finding and initiating contact with employers, understanding employer needs, resolving concerns, and providing quality service. Short, informative, inspirational videos addressing issues and strategies on job development. Useful for staff training at all levels. Customized employment is a process-driven concept with four essential components: discovery, job search planning, job development/negotiation, and post-placement support. This document provides a complete CE model as well as a list of knowledge, skills, and abilities necessary to provide effective customized employment services. A list of 38 competency areas based on those developed by APSE (Association of People Supporting Employment First) and expanded beyond supported employers. Competencies address multiple approaches to employment for people with disabilities, including competitive employment, Customized Employment, supported employment, and transitional employment. APSE (The Association for People Supporting Employment First) has a national certification program (CESP) for employment support professionals. The certification is earned through successfully passing the CESP national exam. This exam is offered nationally at various times during the year.